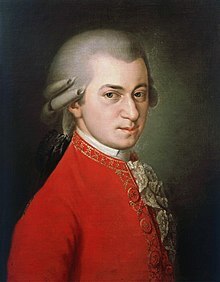 Wolfgang Amadeus Mozart (27 Januar 1756-5 December 1791) wis an Austrian chiel that componed muisic. He wis born in the ceety o Salzburg on the 27t o Januar 1756. He componed aboot 700 bits o muisic, includin the operas Don Giovanni an Die Zauberflöte. He dee'd on the 5t o December 1791. It isna kent the reeson Mozart deed, houaniver maist doacters nou think he wis no weel an wis deid frae rhoomatic feevr. Wikimedia Commons haes media relatit tae Compositions by Wolfgang Amadeus Mozart. This page wis last eeditit on 18 Dizember 2018, at 10:44.